TGIF!! I don't know about you, but this week sure felt it crawled by. It could be because I am a bit under the weather. Either way, the long weekend is here and hopefully, you all have something fun planned! This week's Friday challenge with Your Next Stamp could be just what you need to pass some downtime this long weekend. I decided to make a fun pirate card using the sketch and the new release set of Yo Ho Ho. The main panel was lightly sponged with some distressed before adding some waves using the new Tiny Waves die and some kraft cardstock for land. The ship and pirate were colored in with Copics before being cut out using the coordinating dies. 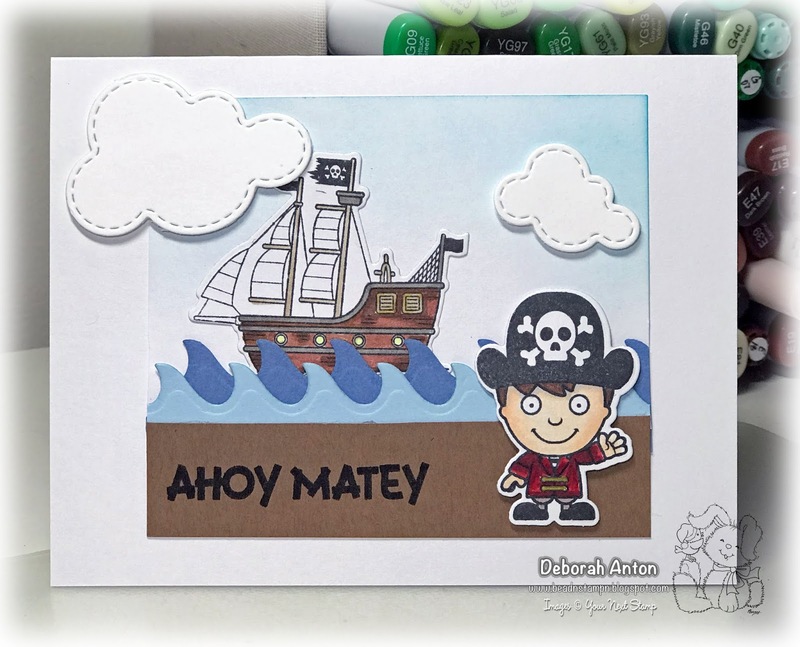 The card was finished with some Stitched Puffy Clouds popped up along with the little pirate. The sentiment was stamped directly onto the land. Be sure to stop by the YNS Blog to see all the creations for this challenge by the DT and hope you will be able to play along! Thanks for stopping by and have a great Memorial Weekend. Please remember to take a moment to remember those who have given the ultimate sacrifice of their life so you can live yours and enjoy such a weekend.